Hello all, remember I shared with you guys that Etisalat had launched its 4G LTE service here, right about we have confirmed information that you do not have to buy a new Sim before you can enjoy Etisalat's 4G LTE services. Just in case you already swapped your SIM card and lost precious contacts, in a bid to switch to 4G LTE, believe me, you need not have. If you are on the Etisalat network, you do not have to swap your SIM to enjoy 4G LTE services. “On the Etisalat network, 4G LTE from 3G is just a click away. No need to change your SIM. We promised to make things easy and trust us to deliver,” says Adebisi Idowu, Vice President, Marketing. “We are more particular about enhancing lifestyles with the quality of Etisalat 4G LTE. There are so many people, doctors, retailers, content developers, who want to get online, make calls and communicate to have an impact. They want to do it now, without the stress of network quality. That is what 4G is about. Superfast broadband internet with uninterrupted connectivity, clearer voice calls, flawless online streaming, HD-quality videos and more. We’ve been working hard on taking 4G beyond Lagos and hope to be live across the country soon,” he said. Reviews are already coming in from Lagos. 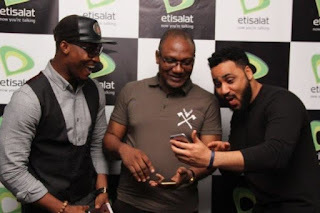 TV personalities, Zainab Balogun, Gideon Okeke and Illrymz were among the subscribers who shared their Etisalat 4G experience. Gideon’s take on the Etisalat 4G: “Superfast. No buffering. No kidding.” As for Illrymz: “Imagine streaming online with clients and my audience, live from the studio, without worrying about glitches. That’s the 4G experience. Perfect for me,” he said. Zainab was glad Etisalat had considered various choices and pricing for its wide range of consumer needs. Jennifer Mba, another customer and a 19-year-old student, was equally excited. ‘Music download and movie streaming are unbelievably clearer, and without a single pause. When I search on Google, the results come in almost at the same time I clicked go. No blurred images, no waiting, no booting, just instant internet access,’ she said. Etisalat Nigeria launched its mobile 4G Long Term Evolution (4G LTE) last week. It certainly seems the telco is off to a great start and sustaining the momentum.